Thursday afternoon saw the final wiring go in to place. I won't show you that, because I'm no ambassador of layout electrics. Just imagine a few random wires. That's all I'll say on that matter. It works though. Point operation is simple, just wooden knobs attached to wood dowels with a bit of wire poking up through the baseboard to the point tie bar. Push. Pull. Easy. Cheap. Note the 'acoustic' controller, a trusty Gaugemaster feed back style hand held unit. No DCC for me, I've tried it, and do own some Lenz DCC thing, but prefer the analogue approach (I prefer acoustic guitar to electric as well, works in a power cut too). I've far too much stock, and even if there were enough hours in the day to convert it all, I really cannot justify the cost. 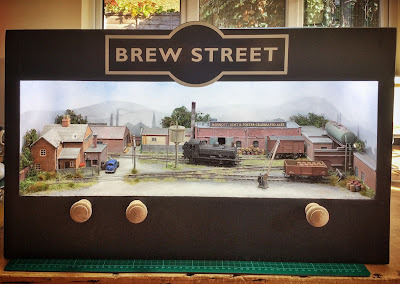 I only really play trains at model railway shows - maybe one or two shows a year. 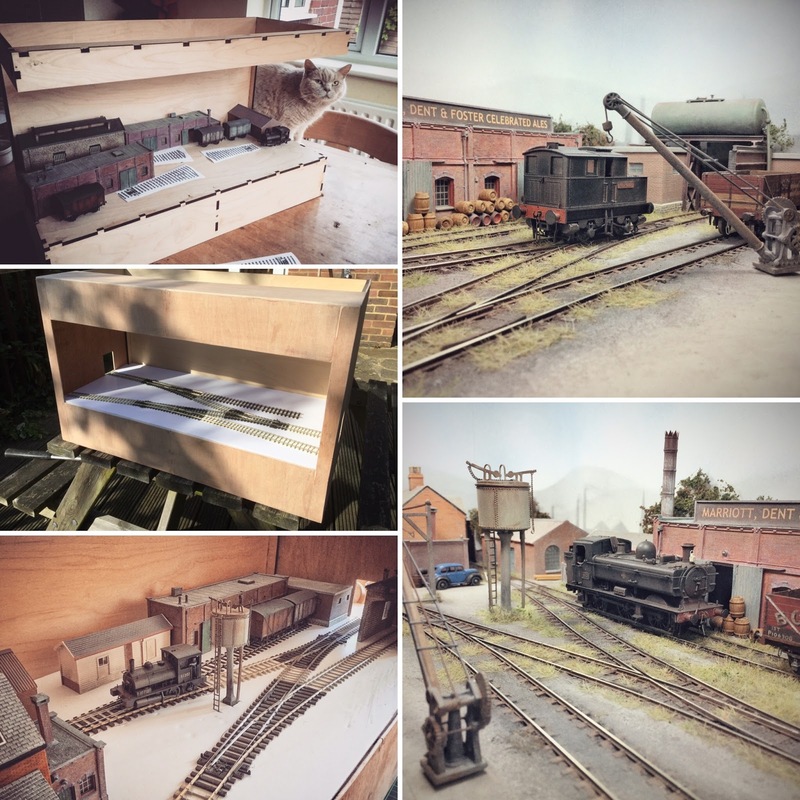 I still need to sort out out a couple of fiddle yards, I do have two generic cassette yards I use for all my layouts, but they're really too big for such a tiny layout. 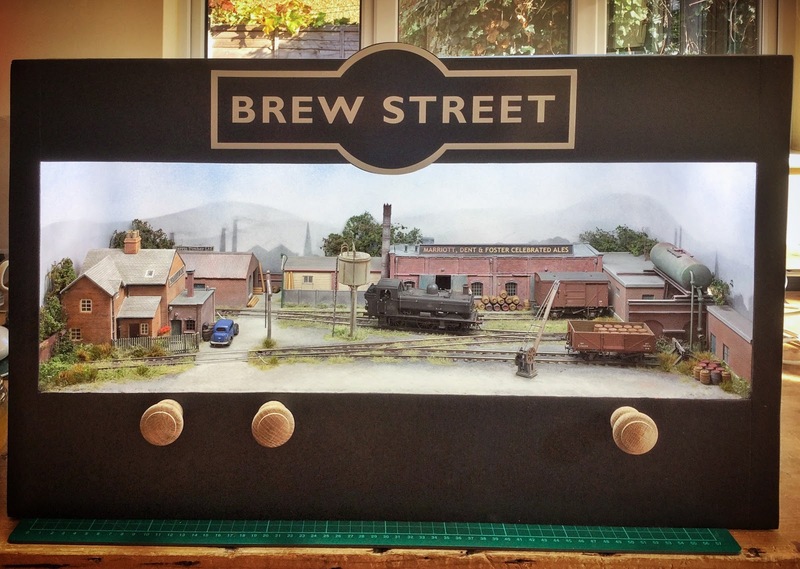 Brew Street will form part of the Model Rail stand at the Warley MRC show at the NEC Birmingham 26 & 26 November 2016. See you there. One Sunday afternoon, I was up in my railway room having a rare tidy up, and whilst looking at those ‘wall flower projects’ (things we’ve built, but have no home; they sit on shelves not joining the railway party) we all have. 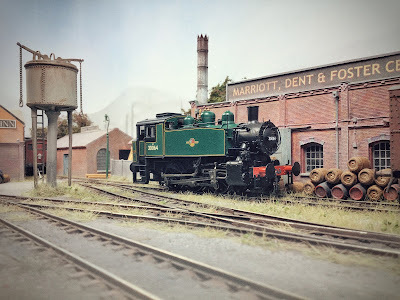 I wondered if some of them could be incorporated in to a small ‘quickie’ project, a project that could be completed in a very much shorter time than previous layouts. I had a spare made up ‘Tim Horn’ laser cut baseboard (2 x 1 foot / 65 x 30 cm), so I grabbed a few of the buildings to see if I could make up some kind of workable composition that a railway could fit in to. The whole project took around 50 hours spread over two weeks. You'll be able to read more about this and how it was done in the next Model Rail magazine www.model-Rail.co.uk out in around 3 weeks. The little layout will be on show on the Model Rail stand at the NEC Birmingham 26 & 27 November 2016. Pop by and say hello!